This work is made up of three books written by Rav Moshe Chaim Luzatto, Ramchal, which he considered to contain the key to the Talmud, the “operating system” for the entire Torah She’bal Peh. We all know that the thinking of our Sages is both profound and precise, but the Ramchal was the only one to set down their thought process in an organized, systematic, and complete program that can be taught and reproduced. Contains completely revised editions of two previously printed works, plus one never before translated into English; Hebrew with facing English text, including full-color study charts. 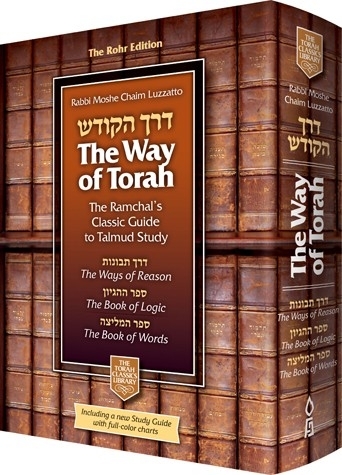 The Ways of Reason makes Gemara learning exciting and accessible to every Jew. There are tools for thinking, illustrated by extensive examples from the Gemara; and whether you are a beginner or a veteran in Torah learning, you will see mastery of the Gemara text becoming quicker and easier. The Book of Logic explores key logical concepts of Talmudic analysis that lead us into a world where ideas take on a life of their own. Based on precision and clarity of thinking, you will see that there is no Beis Midrash without new Chiddushim in Torah. The Ramchal stresses that our inherent intellectual powers must be studied, cultivated and nurtured. Conscious awareness of our thinking and our thoughts is the key to the crown of Torah. The Book of Words is a guide to the language of Chazal, using numerous examples from Tanach and Gemara. Drawing on an extraordinary understanding of human nature, Ramchal explains the rules of communication affecting the head and the heart alike. The links in the chain of our Mesora from Rabbi to student are forged from this metal, and Ramchal declares that the writings of the Prophets are virtually inaccessible without this sensitivity to language; the same holds true for the Mussar classics. This work appears here for the first time in an English edition.